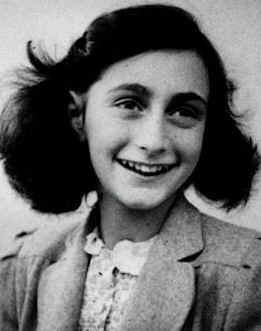 On September 3, 1944, Anne Frank, the young Jewish girl who ultimately gave the Holocaust a unique yet universal human face through her famous diary, was sent to the Auschwitz death camp. A month earlier, thanks to an anonymous Dutch tipster, the SS discovered the hiding place in what Anne called the “Secret Annex.” Anne, her family, and four others were arrested and sent to Westerbork. Anne Frank, her parents Otto and Edith and her sister Margo had been in hiding with four other Jews, Hermann, Auguste, Peter van Pels, and Fritz Pfeffer, since July of 1942. Victor Kugler, Johannes Kleiman, Jan Gies, and Miep Gies, who were business associates and friends of Otto Frank’s, prepared an attic apartment for his family to evade capture from the Nazis at great personal risk to themselves. Miep especially put herself in danger by bringing the group food, clothing, and other necessities. And there they all remained until they were found out, sent to Westerbork, and put on a train to Auschwitz on September 3, 1944. Upon arrival, 549 Jews, including all children under the age of 15 (Anne was 15), were immediately put to death in the gas chambers. Of those remaining, the males and females were split up, separating husbands and wives forever. Hermann van Pels fell into a deep depression and was gassed a few weeks after arriving at Auschwitz. In the women’s block, Edith Frank grew extremely close to her two daughters. A friend of Margot’s also imprisoned at Auschwitz recalled that Margot and Mrs. Frank were given the chance to transfer to a different, safer work camp, but since Anne had scabies and could not go they passed up the opportunity, which could have saved their lives. Margot and Anne were sent to Bergen-Belsen in Germany at the end of October and had to leave their mother behind. Edith Frank died at Auschwitz in January of 1945. Bergen-Belsen was rife with disease and the prisoners were all half-dead from starvation. Anne reunited with an old school friend across the barbed wire fence at the death camp, who later remembered Anne and Margo’s health quickly deteriorating. Sadder still, Anne’s boundless store of optimism had run out, and when she and Margo contracted typhoid they both died within days of one another in March 1945. Margo succumbed first, then Anne. Just weeks later, Bergen-Belsen was liberated by British troops. Otto Frank was the only one of the eight who had hidden in the Secret Annex that survived. Miep Gies, who had saved Anne’s diary the horrible day the SS came and took them away, presented the book to her father. Her diary was first published in 1947, and is now, and will always be, a testament to the resiliency of the human spirit in the face of unspeakable atrocities.